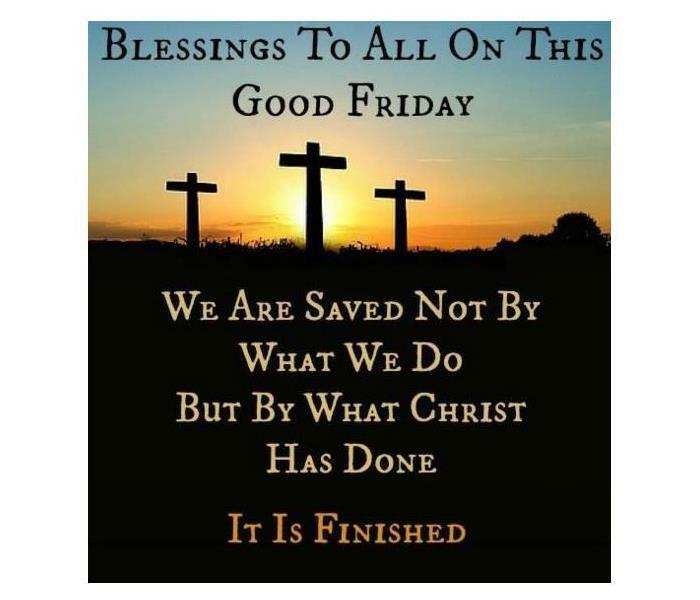 Many people in different countries celebrate the anniversary of Jesus Christ’s crucifixion, and death on the Friday before Easter Sunday. This is an observance that involves people fasting and praying. Many church services are held in the afternoon, usually around noon or midday to 3pm, to remember the hours when Jesus hung on the cross. Many churches also observe the day by re-enacting the procession of the cross as in the ritual of the Stations of the Cross, which depicts the final hours of Jesus’ life. Water damage is one of the most common and costliest disasters your home can experience, costing billions of dollars annually. Safeguard your most important asset against water damage with the right insurance coverage and the following practical advice. Reseal your basement. Water in the basement is often caused by cracks in building foundations or floor slabs. If you notice water seepage after heavy rain when you've never had a problem, it may mean that your once-waterproof cement floors and basement walls have deteriorated. Painting vulnerable areas with water sealant can prevent seepage. Make sure water drains away from the building. Seepage is exacerbated by soil that has settled in a way to make water flow toward the building. After a storm, and especially if the ground is already saturated, rainwater that flows towards the building goes down the outside of the foundation wall potentially through any cracks. Install a backwater valve. Though less common than other causes of basement water, sewer backups are messy. Learn more about your sewer responsibilitiesand install and maintain a backwater valve, which allows sewage to go out, but not come back in. It’s that time of year to start worrying about the spring storm season. And one private weather forecaster, AccuWeather, is predicting a higher frequency of severe storm risks in Tornado Alley, which will include parts of Texas, Oklahoma, Kansas and Nebraska. The Dallas-Fort Worth area is often considered to be on the southern end of Tornado Alley, though one study has suggested it may be shifting eastward. “We believe that the more traditional severe weather region of the central and southern Plains will have a higher potential for tornadoes and severe weather more frequently than they have experienced on average the past three years,” Paul Pastelok, AccuWeather’s Lead Long-Range Meteorologist, said in a news release. SERVPRO of South Arlington is here for all of your restoration needs! If your house is flooded or damaged by a leak or overflow of water, the repairs can be extensive and expensive. Here’s what you can do to help fix the problem. It’s too late. The sump pump stopped working, and now the basement’s flooded. Or, you didn’t realize the upstairs toilet was overflowing until you noticed water seeping through the ceiling. Whatever the cause of the unexpected flood, there are certain steps to take (and ones to avoid!) that will help minimize the damage. It might seem obvious, but in a sodden moment of “Oh crap!” and a rush to soak it up, you might forget to locate the source of the leaking water and turn it off. Once the water is shut off, your responsibility is to protect the home from further damage. Place buckets in rooms with active leaks, and move valuable and light furniture to a safe place. Use a tarp in the affected area if necessary. A pool of standing water in your house might cause you to panic — which is understandable — but whatever actions you take, avoid messing with anything electric. SERVPRO of South Arlington is here 24/7 365 for all of your restoration needs, call us today we would love to serve you 817-557-1505. When your home is faced with water damage, it is easy to become overwhelmed. Your initial stress will probably result from the fact that your pipe just burst and your basement is flooding, or that your faucet has been leaking for weeks without your knowledge and you can’t possibly wrap your head around how you didn’t notice. After that initial stress sinks in, further stress arrives around damage control, as you scramble around your house trying to reduce the harm currently being done to your home. While a million different thoughts are running around in your head, it can be difficult to focus on what you should be doing. In order to know what you should be doing, it is important to identify what type of water leak you have. SERVPRO of South Arlington is here 24/7 365 for all of your restoration needs. Nobody is prepared for a water damage in your home or business. Fortunately, SERVPRO of South Arlington is prepared and here 24/7 365. We’re faster to any size disaster, we can provide an immediate emergency response to help prevent secondary damage and mold. We’re highly trained water damage specialists with advanced training and expertise, not to mention the tremendous amount of hands on experience. We use advanced drying equipment and techniques. Our technicians extract standing water then dry out your property quickly and efficiently. We then finish our job with professional-grade cleaning, sanitizing, and deodorizing products for your comfort and safety. SERVPRO of South Arlington specializes in the cleanup and restoration of residential and commercial property after a fire, smoke or water damage event. Our staff is highly trained in property damage restoration. From initial and ongoing training at SERVPRO’s corporate training facility to regular IICRC-industry certification, rest assured our staff is equipped with the knowledge to restore your property. SERVPRO of South Arlington is always ready to serve you in all of your restoration needs. Mold infestations can be caused by minor water intrusions, like a slow roof leak or loose plumbing fitting. If you suspect your home or business has a mold problem, call SERVPRO of South Arlington, who will respond quickly and work fast to manage the situation. Mold can spread quickly through your home or business if left untreated. SERVPRO of South Arlington can respond quickly, working to first contain the infestation to help prevent its spread to other parts of your home or business. Next, we will begin the remediation process, working safely and effectively to manage the situation. We have the training, experience, and equipment to contain the mold infestation and remediate it to preloss condition. Major storms and flooding events can overwhelm many restoration companies. On the other hand, SERVPRO of South Arlington can access resources from 1,700 Franchises across the state and country and even utilize Disaster Recovery Teams for major storms and disasters. SERVPRO of South Arlington is locally owned and operated, so we are part of this community too. When you have a flooding or storm emergency, we’re already nearby and ready to help. We take pride in being a part of the North Arlington community and want to do our part in making it the best it can be. We are proud to serve our local communities! SERVPRO of South Arlington is here for all of your restoration needs. SERVPRO of South Arlington is here 24/7 365 days, waiting to serve you with all of your restoration needs. In addition to fire, smoke, and soot damage, your South Arlington home may also suffer from water damage as a result of the firefighting efforts. This type of damage can be especially upsetting and destructive for your family to process. You may feel stressed, confused, and vulnerable, so you’ll need a caring expert to guide you through this crisis. We’ll treat you with respect and empathy, and we’ll always treat your home and belongings with care. SERVPRO of South Arlington specializes in fire and water damage restoration. We have the specific damage restoration training, personnel, and equipment and can quickly restore your home to pre-fire condition. When fire and water damage strikes, a fast response is critical. We’re dedicated to responding immediately, day or night, to your South Arlington home or business. A faster response helps to prevent secondary damage and to reduce cost.